Amid the war between Congress and BJP over the formation of government in Manipur, incumbent Chief Minister Okram Ibobi Singh on Monday stepped down as the Congress Legislative Party leader. According to sources, during the Congress Legislative Party meeting, the three-time Chief Minister Ibobi stepped down, admitting that some MLAs may not support him for his fourth term. The latest development comes just a day after he was elected as the Congress Legislature Party leader. 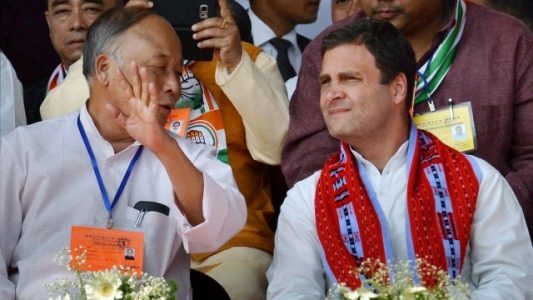 The 68-year-old politician, who had earlier made a record of running three successful governments from 2002-2017 in the insurgency-hit border state, had led from the front during the polls and helped the Congress emerge as the single largest party in the state. He won from the Thoubal Assembly seat by a margin of 10,400 votes. Rights activist Irom Sharmila, making her poll debut, was relegated to the fourth position. Meanwhile, Governor Najma Heptulla has asked Ibobi Singh to submit his resignation immediately, so that the process of formation of the next government can be started. However, Manipur Raj Bhavan has denied reports of calling any party to form the government. On Sunday evening, the BJP had claimed that it enjoyed the support of 32 MLAs in the 60-member assembly. They also submitted a letter from the Naga People’s Front (NPF) president regarding their support to the BJP to form the government, sources said, adding that the Governor is yet to invite any party for government formation. Earlier in the day, senior Congress leader P Chidambaram accused the BJP of “stealing” elections in Goa and Manipur, saying a party which comes second has “no right” to form the government.